New 2014 Yamaha F150LA four stroke. Manufacture date 09/14. Amazing Acceleration: A 10mm offset crankshaft helps provides greater intake volume, and four tuned intake tracks increase low-and mid-range torque, boosting acceleration. Power/Reliability: A 16-valve Double Overhead Cam maximizes power by using four valves per cylinder, eliminating rocker arms and their adjustments and increasing air supply and volumetric efficiency for better performance. Exceptional Performance: Electronic fuel injection is controlled by the Engine Control Module. It continually adjusts the fuel/air mix to properly match engine load and speed. Minimized Vibration: Twin counter balancer shafts on the F150 minimize engine vibration for a smooth, pleasant boating experience. Corrosion Resistance: Our exclusive ACP-221 Paint Process provides a tough, five-layer barrier against corrosion. 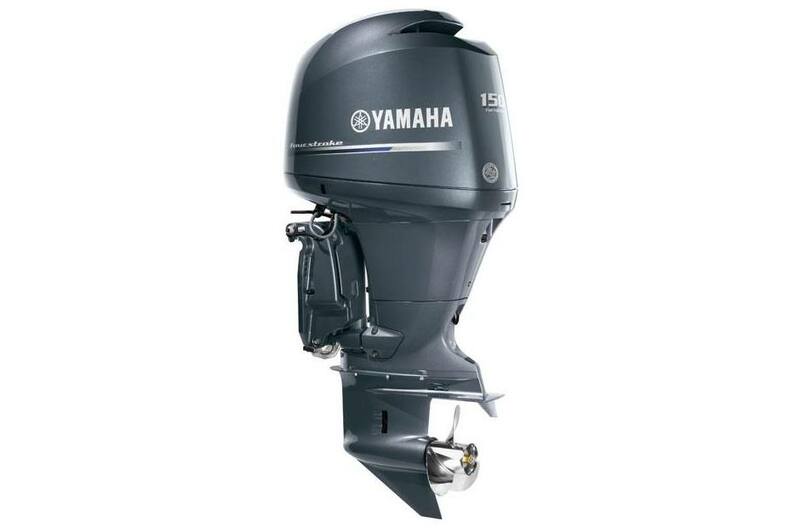 It’s a key part of our renowned Ultimate Corrosion Protection System that’s standard on all Yamaha Inline four stroke engines. Anti-Corrosive Barrier: Our exclusive YDC-30 Alloy is the most corrosion-resistant base material in the industry. Used with our proprietary ACP-221 Paint Process, it provides an extra-tough barrier against corrosion. These measures are both key components of our renowned Ultimate Corrosion Protection System, which is standard on all Yamaha inline four strokes. Smooth Operation: Unique Twin Counter Balancer Shafts counteract vibration normally associated with internal moving parts for smooth operation and a pleasant boating experience. Degree of Trim: -4 through 16 deg.